Whether you are looking for a light and mobile grooming table or a professional heavy-duty grooming table, Flying Pig got you covered. Indeed, Flying Pig grooming tables are built for demanding groomers who are after a solid product that will last for years, not months. Obviously, because thinking, designing, manufacturing and polishing a durable and versatile grooming table takes a lot of research and time. Flying Pig tables aren’t the cheapest out there. They range from $100 for mobile tables, all the way up to the $1000-mark for their heavy-duty hydraulic tables. What makes Flying Pig a great grooming equipment brand, I hear you ask? 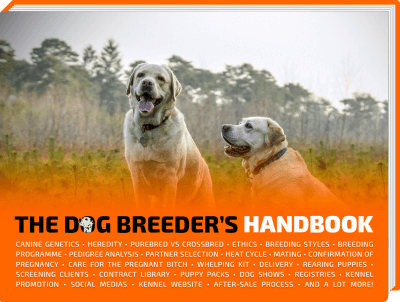 Let’s review the best Flying Pig grooming table in each of these aforementioned categories. Skip this part if you are price sensitive. 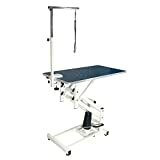 A huge jump in prices for this foot-operated hydraulic grooming table but quality comes with a serious price tag. For professional groomers and pet grooming salons, this heavy-duty table is a wonderful combination of ergonomy and practicality, thanks to the smooth height adjustment. 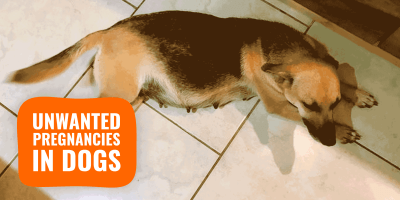 The lift range goes from 19.5″ to 39.75″ allowing you to work with pets of all shapes and sizes. At the bottom is an all-steel H-base built for stability; while the smart Z-frame is built for fast lifting and anti-wobbling. Having a foot-operated hydraulic lift allows for hours of comfortable grooming works with precision never seen before. No more bending as it’s your table that adapts to you. There are also four leg levelers and a grooming arm with loop delivered with the table. The Flying Pig Hydraulic Grooming Table is an expensive, top quality and professional-grade grooming table for exigeant groomers. Everything is very easy to assemble and the heavy-duty hydraulic pump is paired with a year warranty. The frame has a two-year warranty. For groomers handling large dogs, its large dimensions of 44″L x 24″”W x 31.5″H make this table can cope with dogs weighing up to 300 lbs. 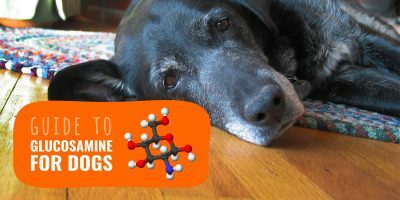 Thats the equivalent of two Newfoundlands so yes, you should be fine with most pets. The full package is over 45.2 pounds so definitely not mobile even if you can fold it easily in order to bring it somewhere else. 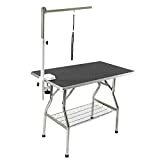 Ideal for a salon, this Flying Pig Professional Table offers everything a groomer needs from an affordable grooming table. Here as well, every single material used is easy to clean and the stainless steel is rust resistant. 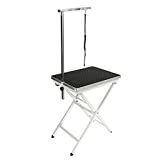 With two adjustable height settings and a total weight of 28 pounds, this mobile grooming table will easily fold. The entire high-quality steel frame has been conceived with easy transportation and storage in mind. Ideal at home or on the road, this is a go-to table for those who only need to do some punctual grooming works or if you attend dog shows, it is a perfect table to have at reach. This Flying Pig portable grooming table is delivered with its own stainless steel foldable grooming arm and loop for a fully usable equipment, out of the box. Extremely useful, the tabletop has a non-slip surface that is easily cleanable and disinfectable. The general feedback is that for the relatively low price, it is a great product that is very sturdy. People would expect more flimsiness from a small portable grooming table but they couldn’t be more in the wrong. Because prices vary so much, it’s not much the products that we should review but rather your mind that will need to establish what exactly you need. Whether you need quick works done, a more stationary grooming station, or a premium top-grade Flying Pig grooming table, Flying Pig got you covered. There aren’t many manufacturers of high-quality pet grooming tables but here you have a wide-range of premium products, all catering to a particular audience. 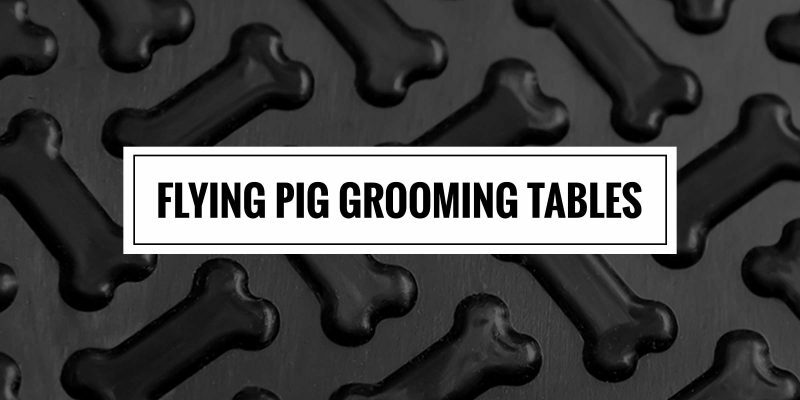 Flying Pig grooming tables will last you more than you can imagine and their price will be the least of your worries once you start using them comfortably. 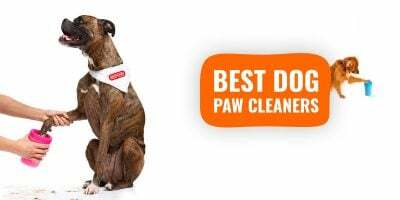 Make sure you check out our dog hair dryers, force dryers, grooming tables and professional dog clippers.